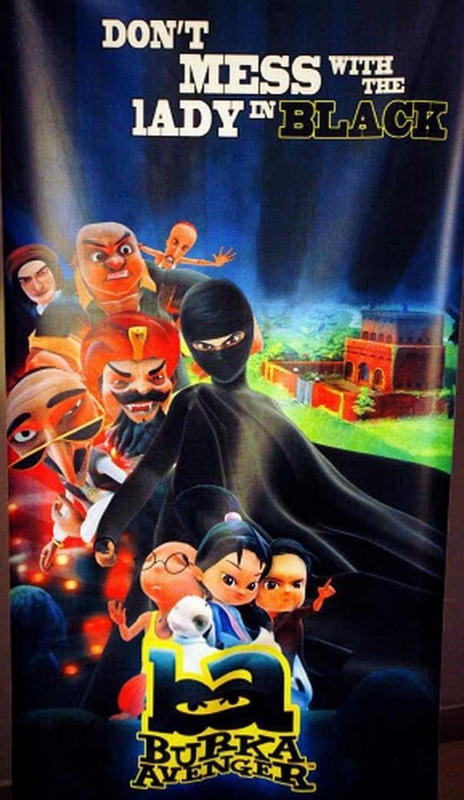 The Burka Avenger is a children’s cartoon about a mild-mannered female school teacher in Pakistan who has an alter ego. As the black-clad Burka Avenger, she takes on oppressive and intolerant Taliban types with the power of education and books. The concept, by rock star Haroon, is full of reversals and appropriations. Thus, the full black face-covering, or burka, is not customary among Muslims in India and Pakistan, where until recently most women went bare-headed in most circumstances, using a scarf-like diaphanous dupatta to cover their necks and chests and sometimes putting it on their heads. The burka or niqab, the full veil, is a Gulf custom spread in Pakistan by guest workers returning from places like Saudi Arabia and Kuwait, and it is decried by Pakistani feminists (and just non-Salafis) as a form of patriarchal oppression. The cartoon only uses it as a way for the heroine to remain anonymous while taking on . . . patriarchal repression.